We deal with the production and sale of additives fordiesel. One of the representatives of these products is the SUPER DIESEL ADITIV in the winter version. It is a multifunctional anti-corrosion additive that prolongs the life of the fuel system, reduces fuel consumption and improves vehicle operational availability in the winter by increasing the cetane number of diesel. 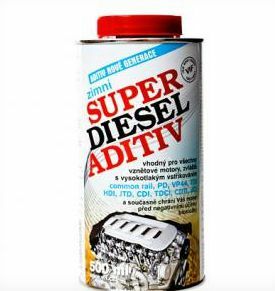 The SUPER DIESEL ADITIV winter additive contains a component that reduces the freezing point at low temperatures up to 5°C.